Can you believe it’s time to start thinking about holiday cards? I certainly can’t. And yet, here we are, and it’s almost October! I’ll bet it’s crossed your mind, however briefly. Well, grab on to that thought and book your mini-session now. Want to know more? Check out the FAQ. Yes, I’m available on both Saturdays and Sundays. I am also available during the week. Where do the mini sessions take place? I have a variety of outdoor locations that will make a perfect setting for your photos. When you contact me to book your mini session, we will discuss what location works best for you. If I choose the digital option, can I print photos anywhere I’d like? Yes. Along with your digital files on a CD, you will receive a print release form. The files you will receive may be printed up to size 5×7 at a lab of your choosing (Walgreens, Sam’s Club, Costco, etc.). What file format are the digital images? The digital images are in JPEG (JPG) format. Can I use the digital files to print my own holiday cards? If I choose to receive 50 cards, but need more than that, can I order more? How many people can I have in my photos? 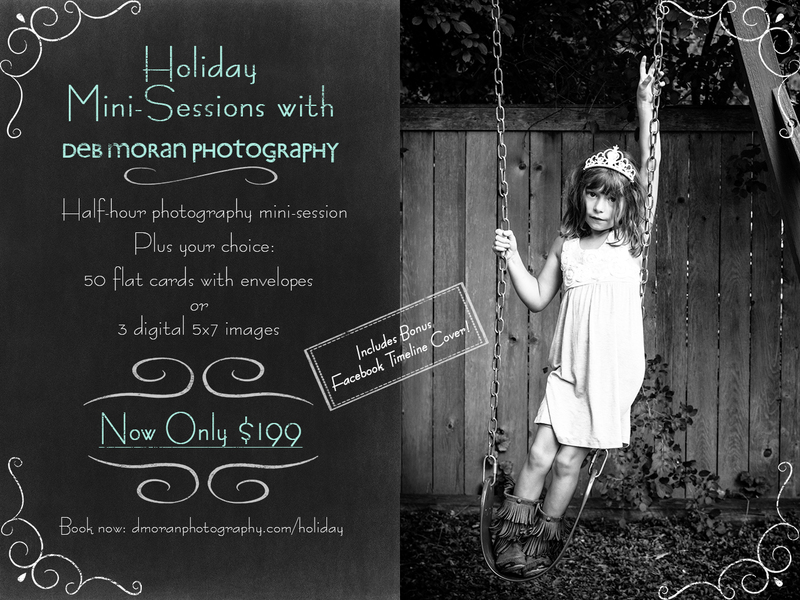 The mini sessions are set up for your immediate family of up to 6 people. Is your family larger than that? Just call me and we can discuss options. I have another question not addressed here. How can I get more information? Call me at 847.722.4402, or use the Contact form. This entry was posted in Children, Families, Holiday Cards, Portraits, Professional Photography on September 28, 2014 by Deb Moran.